7 Nutrition Tips I Tossed Out The Window - Welcome to SarahKesseli.com! It makes me cringe to think about all of the terrible nutrition advice I have followed over the years. Low carb, no fruit, no sugar, no fat, no salt, no, no and more no! Do we see a trend here? It seems like everything is forbidden. Who can blame us, though? Every time we turn on the tv or pick up a magazine, it seems like there is a new ‘diet’ trend telling us how to stay healthy or skinny. It’s overwhelming and confusing! Most of us know what ends up happening when we jump on the latest nutrition trend. We start seeing results, feel great and then in walks our friend deprivation. Deprivation doesn’t just walk in; it kicks down the doors sending us running for the ice cream in the freezer or the bag of chips we have stashed up in a high cabinet. It has happened to me more times than I would like to admit. But, over the years I learned that many of the tips I used to follow just didn’t work for me. I love salt; I love sugar, and I love fats. Now, don’t get me wrong, I still eat a very healthy diet 90% of the time. I love whole foods, and they make me feel good. But, the other 10% of the time you will most likely find me with my favorite Reese’s Peanut Butter Cups in hand. Have you ever heard someone say, “cutting your salt will help you lose weight?” Water weight maybe. Actual pounds, probably not. For me, cutting the salt made me gain weight! Salt makes our food taste good. When we cut it, we lose flavor. When we lose flavor, we lose food satisfaction. Lack of food satisfaction leads to intense cravings for both salty and sweet foods. This is when deprivation starts kicking down our door. When I added salt (without restriction) back into my meals, I noticed almost immediately that my cravings for salty and especially sweet foods went away! It was insane! I have always loved whole foods, but my cravings for them went way up, and the urges for things like ice cream and chips went way down. “Make sure to eat every 2-3 hours to keep your metabolism up, so you burn a lot of calories” False. Whether you eat every 2-3 hours or just three meals a day your metabolism will burn the same way. The amount of calories you metabolize over the course of the day is not dependent on the number of meals you eat. It is based on your age, height, weight, activity level and muscle to body fat ratio, etc. Eating every 3 hours never left me feeling satisfied and always feeling hungry within 60-90 minutes. My mind was always thinking about how much more time I had until I was ‘allowed’ my next meal. When I switched to eating three big meals and one snack, I began truly enjoying my meals! I was incorporating not only larger portions but a wider variety of foods which helped me keep from getting bored and keep cravings at bay. This tip was one of the first to go. It was probably the first to go because I wouldn’t get home from work until 8:30-9:30 pm many nights. So I had two options: 1) eat or 2) don’t eat. Not eating wasn’t an option. Do you want to know something funny? No matter whether I ate after 8 pm or not, it had zero impact on my weight. The one side note: if I eat too heavy after 8 pm then I wake up feeling bloated, so I try and keep my meals lighter. But the bloated feeling does not mean I have gained weight. Oh, my goodness, if I could even tell you about how little fat I used to eat because I had such a fear of it! I’m sure almost all of us remember the days when “fat was bad because it made you fat.” It was no wonder I would binge-eat a bag of salted almonds on the weekends! My body was dying for the nutrients I was not giving it. When I slowly began incorporating fats back into my diet, not only did I NOT gain weight, but I LOST weight! My body was saying, “THANK YOU SARAH!” Today, if you asked me what my favorite foods were, I would say, “Meat, cheese, eggs, avocado and almond butter.” Hmmm….I think those items would all be classified under the ‘healthy fats’ category? I honestly believe my years or restricting them has led them to be my favorite foods now. For a six-month period of my life, I was told not to consume over 20g of sugar a day. So, I tossed the sugar out the window! What happened next? After four weeks my cravings came back at lightning speed. Think about it, fresh fruit; sugar. My favorite vegetables like Brussels sprouts, sweet potatoes, and carrots; sugar. I wasn’t just cutting out candy and ice cream; I was cutting out some of the most nutrient dense foods that were GOOD for me! All in the name of eating less than 20g per day. And guess what, when I finally said, “That’s enough! I want a banana!” I didn’t gain back a single pound. But I DID gain back my control over my cravings. Thank you, nature. Low carb may be the way to go for some, but it wasn’t for me. Going low carb required me to remove too many of my favorite foods from my diet; brown rice, potatoes, pasta, banana, etc. As the trend has been showing, when I cut these foods out, all I craved was CARBS!! I would find myself face deep in boxes of crackers or bags of chips every weekend. I just couldn’t understand why. Carbohydrates are an excellent source of energy. Yes, excessive intake of carbs (like sugar or anything else) can make you gain weight. However, many studies now show that people who have a moderate carbohydrate intake from whole foods have better overall health! Guess what? Both my physical and mental health significantly improved as I began introducing carbs back into my diet. This tip is my favorite (sarcasm)! Whatever your favorite or ‘trigger’ foods are, hide them, toss them out, DO NOT EAT them! They are FORBIDDEN; until you somehow find them in front of you again, and you decided to eat the entire package because you have been deprived for so long! Sigh! What happens when a child is told they can’t have something? They want it MORE! When you tell yourself you can’t have something; you create excitement around it, which in many cases leads to overeating. White chocolate covered pretzels (next to Reeses Peanut Butter Cups) are my all-time favorite dessert! Why? Probably because they are salty, sweet, have a good fat and carb count. All of the things I would restrict. They were always a “forbidden food” because I was trying to “be good” or “eat healthily.” I had created the excitement around them that lead me to overeat them weekend after weekend. But when I brought the food back into my house and allowed myself to eat them every single day if I wanted; the cravings went away. The excitement disappeared. Today, I could take them or leave them. But in most cases, I will take at least a few! You’d think all of this was a ‘no-brainer,’ right? Well, apparently not. I work with clients every day that struggle with these mindsets. It takes time, patience and grace with yourself to break habits and thoughts that have been ingrained in your head. PS – Did you notice when I cut out foods such as brown rice, fruit or vegetables that my body went in search for those whole foods in the form of lesser nutrient dense options such as crackers, chips, and candy? Funny how that works! 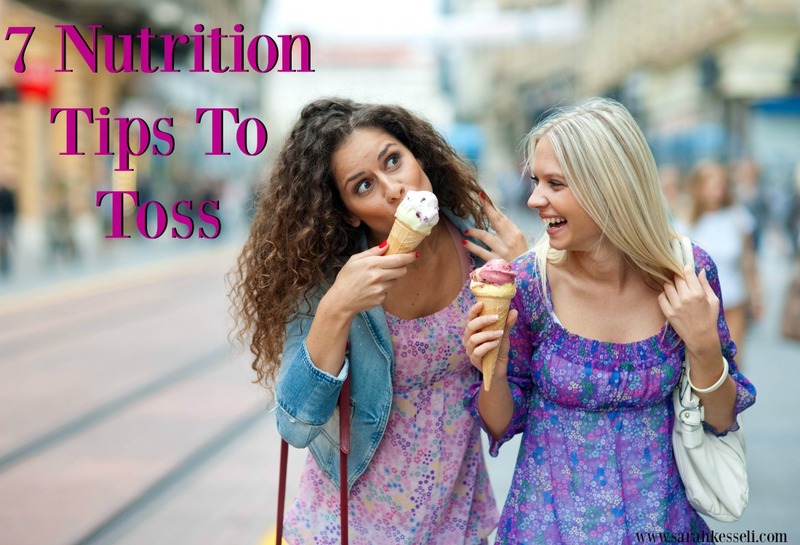 I would love to hear your thoughts or experiences with any of these 7 nutrition tips! Do you struggle with any of these? Are there others that you are trying to break? As always, I am here to support you if you need it!